We know that children learn best by doing! 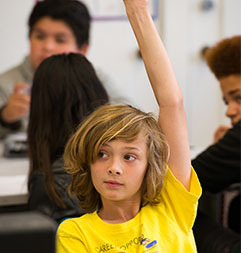 Depth & Breadth — As a project-based learning center that spans the various developmental phases of childhood and adolescence, Nea provides multiple opportunities for individual, partner and group experiences that encourage research, depth of knowledge, mastery of concepts and motivation for continued learning. Benefits — Experiential learning provides clear benefits like: increased critical thinking skills, greater problem-solving abilities, deeper understanding, better preparation for higher education and real work situations, more developed collaborative skills, and an enhanced desire to learn (because it's fun)! Process — Work on projects is initiated by asking "Driving Questions" that help frame the substance of the content and the direction of research and discovery. Learners are supported to produce high quality work through established checkpoints that provide them with opportunity for feedback and revision throughout the process. All of our projects are standards-based, and include hands-on, interactive, and differentiated activities along the way so that learners attain mastery of objectives. Click on the image below to learn about one of Nea's math projects featured in EdSurge - a website dedicated to the best in education technology and trends in teaching.